Tattoo Blog » Meet Jeff Gogue! Tattoo Blog » Inspired » Meet Jeff Gogue! Naturally, it’s completely understandable. When you have something that people really want, sometimes you just need to slow things down a bit in order to have some breathing room. The man’s not a machine. At the same time, however, it’s easy to see why Jeff Gogue is in such demand. He’s a very talented artist who’s interested in more than just the straightforward technical aspects of his craft. 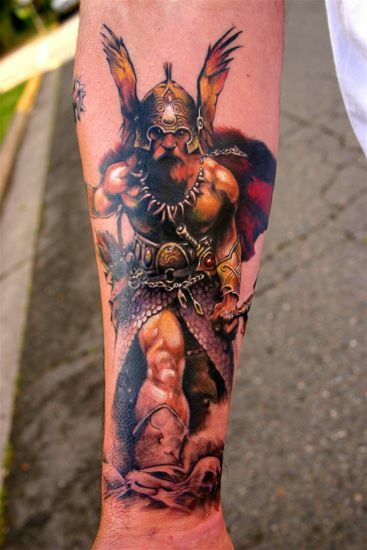 Jeff began tattooing professionally in 2000 and in just ten years time he’s managed to really churn out some truly impressive work. Reading Jeff’s bio and seeing his portfolio, I was struck by how honest he is, both in his work and in his approach to life. There’s a sincerity about him that translates to an artist who truly cares about his customers and the work that he does. Weird, considering that I’ve never even met the guy before, but then again, maybe that’s why his work is so sought after: you can’t fake the sort of honesty. It’s etched into skin and passed on through excellent word of mouth. Even though Jeff isn’t currently taking any more clients, there’s still potential to meet up with him this fall when he leaves Grants Pass, Oregon for brief stints in Massachusetts. From September 12th-14th he’ll be at Off The Map Tattoo in Easthampton and from September 16th-19th, he’ll be taking part in the Paradise Artist Retreat in Hanock.